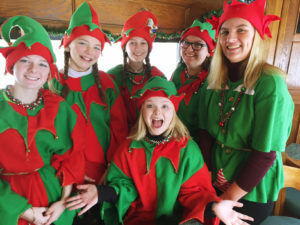 NORTH CONWAY, NH – Santa is on board with his mischievous elves who will be sharing their hot chocolate and cookies with everyone. They’ll take your picture, too, if you ask nicely, so be sure the battery in your cell phone is charged! Trains run at 11:30 & 1:30 to Conway and back weekends only until December 15, when there are two trains daily through December 23. All excursions are approximately one hour long, round-trip.